Today I spent the entire day sitting inside, waiting. But I guess that days worth of killing time is nothing compared to the 60 years many people have waited for what transpired. It was a big day in India, as you may or may not have heard. After decades of waiting, demolitions, murders, riots, religious furor and constant delays the Allahabad High Court declared a verdict on who controls 2.7 acres of land in Ayodhya. You might wonder why so much drama and history was needed over a small piece of land. I would ask the same thing about certain parts of Jerusalem. But, as with many epics, it came down to religion. Is the alleged birthplace of Ram (a king who, in the legend of Ramayana, served as the human ‘avatar’ for the god Vishnu) as well as the site of a 16th century mosque that was demolished by Hindu nationalists in 1992. The demolition caused widespread riots and over 2,000 people were killed (riots 10 years later after a related train bombing saw another 1,000 people killed). It is a long and complicated story as to how this tale that started with a mosque in 1528 and a court case beginning in 1949 ended up in a courtroom today. If you’re interested in a full timeline of events, I suggest you look at this helpful timeline, and if you want a full accounting of the ruling today read this. For me this is not interesting just because of the outcome – the ruling stated that the land should be divided between 2 Hindu groups and one Muslim group, but all sides said they would appeal – but because it is just another fascinating display of what happens when religions collide. As an American it is fascinating to see how religion can be woven into a court decision as though it is fact. And perhaps for many it is. But that’s hardly consolation to Muslims who think that their almost-500-year-old mosque was destroyed. And the land for the Muslims is no consolation to those who would swear that the mosque was built only after an original Hindu temple was destroyed. The thing that gives me faith is this: as of now (knock on wood), there have been no major instances of violence. After a week of delays and waiting with bated breath to see what would happen, there’s a collective sigh that nothing has happened. Has India moved beyond its religious tensions? Of course not. But in a country that is reeling from its embarrassment over the Commonwealth Games, maybe this is a moment to stand proud. It’s not over yet, but perhaps the long-running suit can now hope for closure, instead of fearing more bodies will be added to the count of this saga. And birthplace or no birthplace, mosque or no mosque, that is something to celebrate – especially now that I feel safe enough to leave my house. 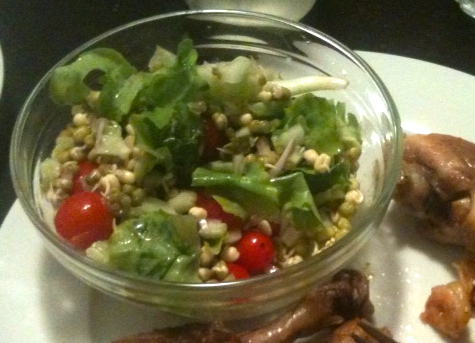 It was a very weird, unsettling milestone: we ate a salad at home. This might seem bizarre as a momentous occasion, but as India newbies amidst a monsoon we had steered clear of the most likely route to sickness – raw vegetables. Every vegetable was meticulously cleaned and then cooked. Every fruit was peeled. Hands were washed before eating anything we were about to touch. Yet in the past few weeks a drastic change has settled into the Mumbai we’ve come to know and love. The rain has steadily stopped. It started with a few days of clouds peeking through the storms. Then longer periods without precipitation. Then full days of the sun declaring its presence. And now, just like that, there’s no more rain. The monsoon has taken its bow and retreated until June rolls around again. For most who live here its a blessing and a curse. The rains are over but now they settle in for a hot month before it cools down again in November. However for us, its just unfamiliar territory. I am so used to carrying around my small umbrella and stepping out in my waterproof shoes. I am so accustomed to knowing that no matter what the sky looks like, it will absolutely rain today. I am in the habit of not solidifying plans until I can tell whether or not we’ll get a full dose of monsoon or whether there will just be a drizzle. I had never lived in a world where it rained every single day. And now I must oddly accustom myself to a world where I will not see a drop of rain again for nine months (unless we have one or two surprise rains left to break this spell). Which brings me back to salad: I (knock on wood) have not had any food-related illness since I have been in India. This is obviously a trend I hope to continue (although now that I’ve put it in writing I’m sure I’m doomed). I think part of it is luck, but part of it has been having a very conditioned approach to food – I avoid anything suspicious, even if I really really want to eat it. But the rains (and the dirt and disease that comes with the rains) are over and so vegetables are less of a danger. Nisha suggested to me the other day that it was safe to eat a salad. I wanted a salad, so I decided to go for it. That night, I sat down at the table and stared at the freshness in front of me. Cherry tomatoes. Lettuce. Onions. All former enemies now claiming to come in peace. I stuck my fork in. It was so delicious – it felt like the antithesis to every heavy curry spicy meal I’d eaten over the last three months. And I didn’t get sick. It may be unsettling. But rains, I’m glad you are gone. My motto in Mumbai is to say yes to anything I’m invited to because you just never know what to expect in this city – and it’s almost always a good story. So in that vein, last night and today I found myself in two scenarios that anyone who knows me would have thought were highly unlikely: at a packed club dancing to a trance techno DJ (I really don’t know the difference between ‘trance’ and ‘techno’, let’s be honest) and at Mumbai’s Fashion Week. Both were cases of just saying yes: our broker, with whom we’ve kept in touch, mentioned to me that one of her favorite DJs was going to be in town Saturday night. She said it was going to be a really fun night and we should come. So I said yes. Why not? Separately, I was at a drinks event and I met a guy who runs a non-profit that tries to bring the arts into impoverished schools. His organization was partnering with one of the designers at Fashion Week and he had extra tickets – so he invited me to go. Who knew what on earth this event would be? But I said yes. So last night I found myself in a room full of elegant high-heeled Mumbaikers sipping their overpriced drinks waiting in breathless anticipation for ‘Dash Berlin’, a Dutch DJ who everyone kept reminding me was “rated as the 14th best DJ in the world.” I kept wondering what a DJ would have to do to make it to 13. I didn’t know whether to enjoy it or laugh at it. My boring old self had the instant reaction of: why is everyone in this room staring at a guy fiddling with a Mac and some turntables? He’s not playing anything. The guy must be on some kind of drug to have that much energy and some members of the crowd were also channeling the same energy source that allowed them to dance with complete abandon. I had a similar reaction to the Fashion Week show. Was it really fun? Or taking itself too seriously for my taste? We walked in and it was certainly larger than I had expected. Mumbai Fashion Week (also known as Lakme Fashion Week) had been advertised around town but I didn’t know how big it was. When we walked in it certainly looked like a fashion show (or at least the photos of fashion shows I had seen). It looked professional and I was standing in line to get in behind Fern Mallis, the head of New York Fashion Week, so I supposed this must have some credibility. But it was just so funny to me – everyone scrambling and haggling to get the best seat they could (a very Indian spin on the concept of a Fashion Week). A hundred photographers stood at the end waiting. But when the lights went down and the music came on, models strutted out it was certainly a bit thrilling – who doesn’t enjoying getting a glimpse of the fashionable life that seems to exist outside of my world? It looked like a New York fashion show but with slightly less impressive models and some very fancy saris mixed into the more traditional fashion. And there I sat, in my Old Navy skinny jeans and H&M top thinking I was an imposter. In both the club and the fashion show I had the reaction of: this is fun, but is it me? But that’s a stupid question here – the whole point of coming to Mumbai was to test those boundaries. It’s to walk through the streets of Dharavi one day and then watch an absurd fashion show the next. It’s to breathe in all the wonders and incongruities Mumbai has to offer. So at the fashion show I just took it all in. And at the club I just let myself dance. I cheered for Dash Berlin, I closed my eyes and let the strobe lighting and bass music carry me for just a little bit. I’m ok with getting swept up in Mumbai. I’m going to keep saying yes. Of all the many things I love about Indians, one thing I particularly adore is their love of celebration. There are so many holidays, so many festivals, so many excuses to dance and party and sing. And with numerous religions and cultures and languages smashed into a city like Mumbai, we certainly see all of them in full swing. We are now in full force of one of my new favorite festivals- Ganesha Cahturthi, or known more commonly as Ganpati (Don’t know how it’s spelled, but that’s what everyone calls it!). It’s an 11 day Hindu festival to celebrate the birthday of the Elephant God Ganesh, who is the god of wisdom and prosperity. It’s sort of reminiscent for me of Christmas in some ways – it’s a birthday celebration where people put up lights EVERYWHERE and everyone is constantly singing. 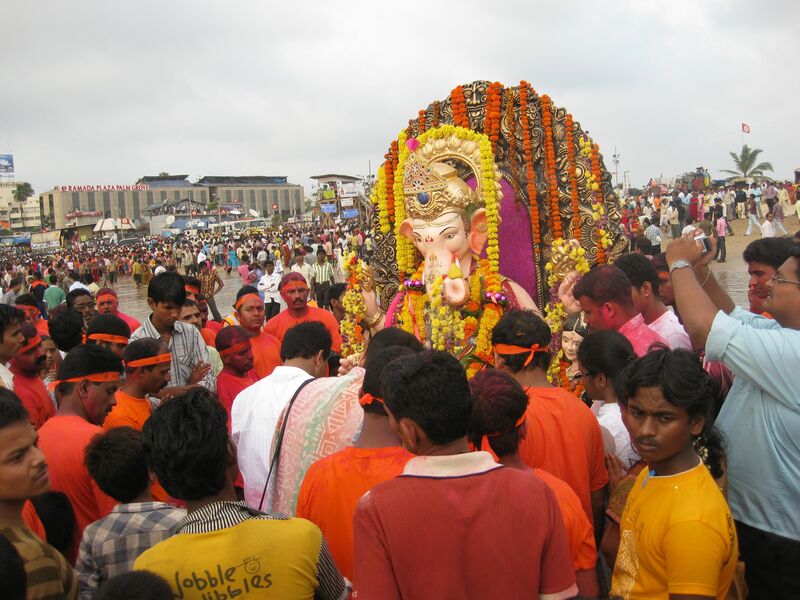 Like Christmas you could not escape the joy of Ganpati – people are swept up in the spirit everywhere. And that spirit has come out every night since Ganpati started last weekend – people come out into the streets, sing, play instruments, and push statues of Ganesh around on a cart. This will all culminate next Wednesday (the 11th and final day) when people will push their Ganesh statues into the sea for reasons on which I am still unclear. I am determined to find out though, and certainly I will blog about it. But just to give you a sense: Below is a compilation of celebrations on my 15 minute drive home tonight. There was not a moment where you couldn’t see a crowd gathered around their community’s Ganesh statue. You couldn’t help but be happy. You couldn’t help but want to join in and thank Ganesh for bringing everyone a bit of joy and laughter.